Following Krista’s excellent post on using secondary dimensions in Google Analytics, this post will explain the GA represents your data using its internal data model and why it’s important to understand this. You’ll see that certain combinations of metrics and dimensions don’t mean what you might think, and that some are actually completely invalid. We’ll cover examples of secondary dimensions and custom reports where seemingly sensible reports are invalid and how to spot and avoid these mistakes. We see the world through our eyes, we smell the world through our nose, we taste it in our mouths and we feel it in our finger-tips. We perceive the world using the same senses but, philosophically we have unique, individual perspectives when we think about the world and what it means to us. We have our own models of the world in our heads. Google Analytics has its own view of the world which it uses to present our data to us. It uses an abstract data model to build a picture of our data to make sense of it, process it and to present meaningful reports. As advanced analysts we need to know about this model and to understand it. If you’re using custom reports or secondary dimensions as described in Krista’s post, failing to understand the model can affect your reporting and potentially present inaccurate and misleading data. What a fantastic resource?! You’re welcome for the heads-up. GA will receive many data hits a day most likely from billions of users visiting millions of sites. To make sense of this data and to correctly deliver the right data in the right report, GA needs to somehow relate these individual bits of data together. The diagram on the right (from the Analytics Academy data model page) shows the hierarchical data model used by GA. Fundamentally, the data is generated by users using sites or apps. Right at the top of the tree is the User. A user will use a site one or more times. Users have multiple sessions. Sessions are made up of many individual interactions or hits – screen views, pageviews, events, and social interactions, for example. 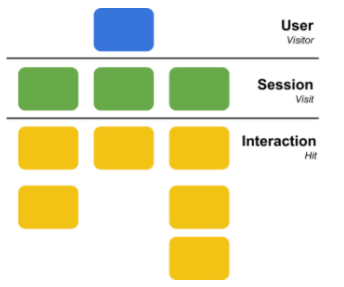 So, we see that a single user has one or more sessions and the sessions are made up of multiple interactions (hits) on a site. These three levels in the data model hierarchy are called scopes. As we’ll see next, it’s vitally important to recognize and understand the scope of the data in our reports before doing any analysis. 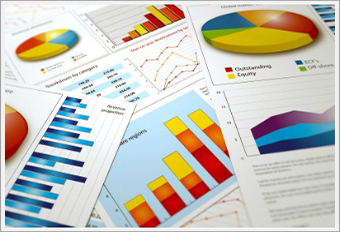 When you’re analyzing data, you’re seeking answers to business questions. It really helps to carefully define the business question so you can identify the scope of the data you need to extract. Which channels are driving traffic to my pages? Looks okay? 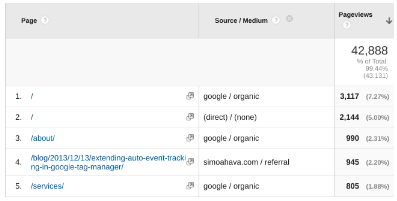 Google Analytics returned my report and I can see that Simo Ahava is going to receive a nice birthday present to say thanks. Not so fast though! This report doesn’t say what you think. Let’s revisit the business question and think about the scope of data we need. When we ask questions about channels driving traffic, we’re asking how users found the site – where did their visit come from? For example, they might click on a search result. Once they’ve clicked the link and arrived at the landing page, they’re free to roam about the site and view any other page they choose. This means that the report tells us that users who clicked through from simoahava.com viewed one of our blog pages 945 times. Our first report actually told us which pages (hit scoped interactions) are being viewed during sessions that started from certain traffic sources (session scoped data). See how that mix of scopes changes the meaning of the data? What we really need to ask is which channels are driving users to specific Landing Pages. A single session can only have one traffic source which means the traffic source is a session scope dimension. Pages are hit level but landing pages are session scoped – a single session can only have one landing page where the session started. It looks like Simo’s birthday present just got more expensive! Notice the landing page where 901 sessions started – this is a different number to the overall pageviews of 945 as we saw in the first report. In the first report we mixed a hit scoped primary dimension (Page) with a session scoped secondary dimension (Source / Medium) in the same report. It answered a question but not the one we asked. Notice there’s no ‘Goals’ tab? Individual goal conversions only happen once per session. This makes goals session scoped. Events are hit scoped. 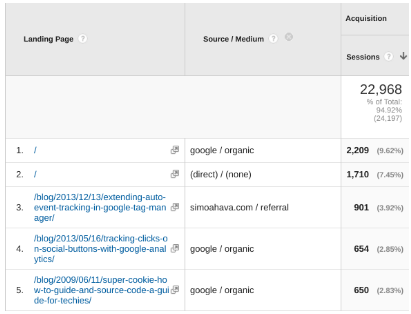 Metrics for goals and events cannot be mixed in Google Analytics. How many users who added products to their cart completed their purchase? Assume that we’re tracking “add to cart” actions using events and we have a goal that tracks purchases. As we just saw, events are hit scoped and goals are session scoped. 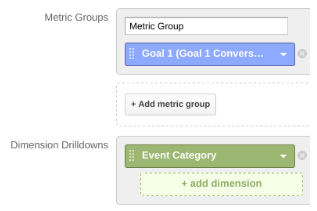 How do we show this data if GA won’t let us mix event dimensions with goal metrics? We solve this oil-and-water mixture using segments but we need to choose our segment conditions carefully. This segment seems to answer the question – we’re only interested in users who added products to their cart so we’re home and dry, right? This segment will do the job. We needed to add a second statement to make sure we see users who had a session where they had an Add to cart event and that transactions per session must be greater than zero. GA will let you combine dimensions and metrics with different scopes. If we can build a report with multiple dimensions and metrics, it doesn’t mean it’s the right one. We need avoid the scope trap by thinking about what data we’re including in the report. This seems complicated, but there is help at hand. This confirms that event dimensions and goal conversion metrics don’t mix. We won’t fall into that trap! This introduction to the Google Analytics data model has highlighted some easy traps you can fall into as you level-up your analytical skills. You always need to fully parse the business question you’re answering with data and you also need to carefully choose the scope of the dimensions and metrics. There is a tool to help you but your awareness and use of data model is a key addition to your analytical arsenal of skills. *This guest post was written by Doug Hall, Director of Analytics at Conversion Works. Doug has extensive experience in web analytics and conversion rate optimisation and is one of the UK pioneers of multivariate testing for ecommerce websites. Follow him on Twitter @fastbloke or on Google+ +Doug Hall. Hi Krista! Thank you for this post by Doug Hall. I meet a lot of analysts that don’t yet understand the internal data model of GA. It is hard to explain what dimensions and metrics should and shouldn’t go together. I made an attempt in this blog post: http://www.analyticscanvas.com/session-vs-page-level-dimensions-google-analytics/. Now I will recommend them to read your blog post too. Thanks! Next ArticleNew Default Position for Widgets Added to a GA Dashboards!